Go over to the search bar at the top of the side panel and type in EA Toggle. 01 Primary: From the Primary tab you can change the label of the toggle texts. By default the label text for primary toggle is Annual. Image- You can pick an existing image from your Media Library or upload a new one. 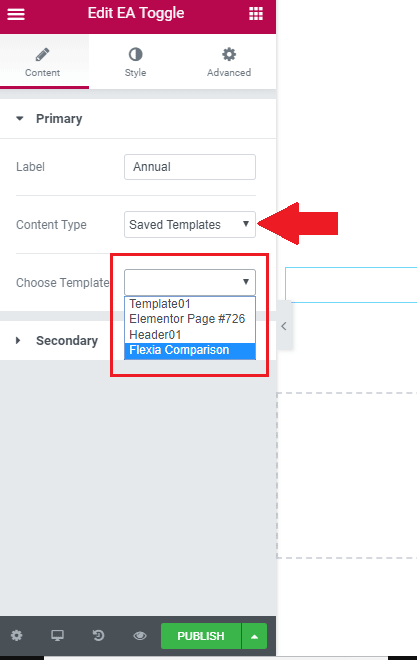 Saved Template: You can use an existing Elementor Template that you had created previously. As soon as you pick this option, you will get a drop-down menu to appear on the side panel. The Secondary Toggle bar will have the same customization options. You will also have the same content type options as you got with the Primary Toggle. First, adjust the Switch styling. 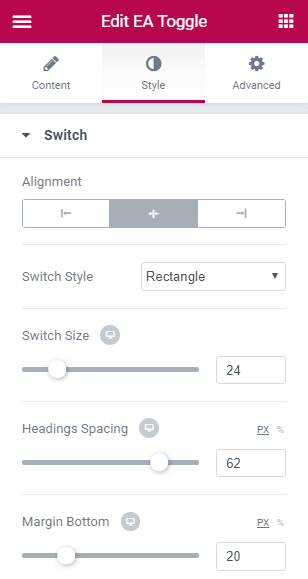 You can adjust its relative alignment to the two sets of label text, switch style, switch size. Then under the same tab, you will find customization options for the Primary and Secondary text. Label: Switch between Primary and Secondary and pick the right background color, text color and active color for both the toggle tabs- Primary and Secondary. Click on the little pencil icon to open the Typography pop-up. Content: Click on the little pencil icon to open the Typography pop-up.